John Hoeven is the junior Republican United States Senator from North Dakota, having won the 2010 election to replace retiring Democrat Byron Dorgan. Previously he served as Governor of North Dakota from 2000 through 2010. 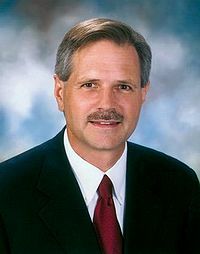 Hoeven was born in Bismarck, North Dakota. He earned a bachelor's degree from Dartmouth College in 1979 and a master's degree in business administration from Northwestern University in 1981. Hoeven served as executive vice president of First Western Bank in Minot from 1986 to 1993. From 1993 to 2000, he served as president and CEO of the Bank of North Dakota, during which time the bank's assets grew from $900 million to $1.6 billion. Under his leadership, North Dakota has expanded and diversified its economy, adding many new jobs and businesses. In 2003, North Dakota led the nation in personal income and wage growth, and in 2005, its rate of growth in per capita personal income was second. When much of the nation struggled through a recession and reported budget deficits, North Dakota continued to grow and diversify its economy. Because of Hoeven's stewardship, the state ended the last fiscal biennium with a substantial surplus going forward, and no new taxes. His current budget continues to provide more state funding for K-12 education, additional revenue sharing with cities and counties, tax credits for farms and businesses, and a property tax break for seniors and people with disabilities. In his second term as governor, Hoeven remains committed to enhancing the state's business climate, holding the line on taxes and promoting North Dakota's targeted industries, which are agriculture, energy, technology, advanced manufacturing and tourism. He proposed new initiatives for research and additional investments in education. These include continued increases for teacher compensation and expanded funding for Centers of Excellence, an initiative that combines education and economic development to create higher-paying jobs and new business opportunities for North Dakota citizens. Hoeven directed the development of a multi-resource energy program for the state, with incentives in each energy sector, as well as a conservation component. North Dakota is the sixth largest energy producing and exporting state in the nation and Hoeven has worked to advance the state's traditional energy resources, like lignite coal, oil and gas, while promoting renewable energy opportunities, such as wind, ethanol and biodiesel. Protecting North Dakota's citizens and communities has been an important focus of many of Hoeven's policies and initiatives, including the introduction of new laws to strengthen the state's violent and sexual offender statutes, and the expansion of North Dakota's efforts to combat substance abuse, while helping young users through rehabilitative programs such as North Dakota's Drug Courts. Hoeven serves as chair of the Interstate Oil and Gas Compact Commission. He previously served as chair of the Midwestern Governors Association and the National Governors Association's Health and Human Services Committee and Natural Resources Committee, as well as chair of the Governors' Ethanol Coalition. Hoeven and his wife Mical (Mikey) have two children, Marcela and Jack. This page was last modified on 9 April 2019, at 10:57. This page has been accessed 5,372 times.